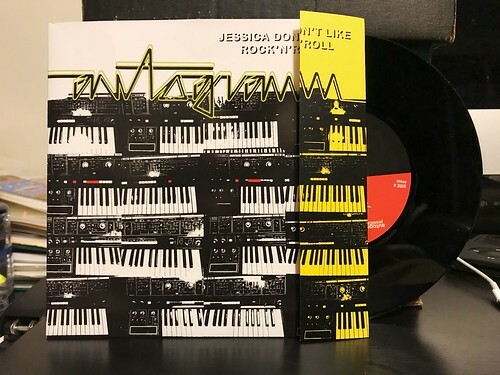 I Buy Way Too Many Records Dot Com: Autogramm - Jessica Don't Like Rock 'n' Roll 7"
Autogramm - Jessica Don't Like Rock 'n' Roll 7"
Snappy Little Numbers came through with another care package of records to review. I have a couple of others that you'll see in the upcoming weeks, but I wanted to start with the one band I wasn't previously familiar with, Autogramm. These guys hail from Vancouver and have turned in two synth laced, new wave pop songs that sound like they're straight out of 1979. Now, there are plenty of times where I could say a sentence like that and go into a pretty negative review. Typically, nothing sends me running for the hills faster than seeing the worth synth when a band is being described. But, to their credit, Autogramm has latched on to a particular style of new wave that I have a great fondness for. Specifically both of these songs remind me a lot of The Cars. Like The Cars, Autogram have a strong pop structure at the root of both songs. They build to the chorus with almost robotic precision, and when the hook appears the whole song comes to life. The synth is used as a decorative flourish here, it's not the defining characteristic of the band or a gimmick that's being leaned on too heavily. While I can't say this is my favorite Snappy Little Numbers release to come down the pike, it's a solid record and a fun listen.